Janis Darlene Martin was born in Southerland, Virginia, just east of Danville, on March 27, 1940. With a stage mum on one side and a father and uncle who were musicians on the other, surely it was inevitable that her destiny was laid out as a musical performer. By the age of six, the little lady had mastered basic chords on the guitar and began singing, and although the young Janis may have been small, she packed a voice that was loud and strong. At eight, she entered her first talent contest and scored a proud second place. For the next two years, she entered eleven contests over a three-state area, winning first place in each one…and one those talent shows had over 200 contestants that took four days of elimination. By 11, Martin was playing and singing as a member of the WDVA Barndance in Danville, Virginia. From the barndance, she traveled with Glen Thompson’s band for two years and then went on the road with Jim Eanes, a former Starday recording artist. 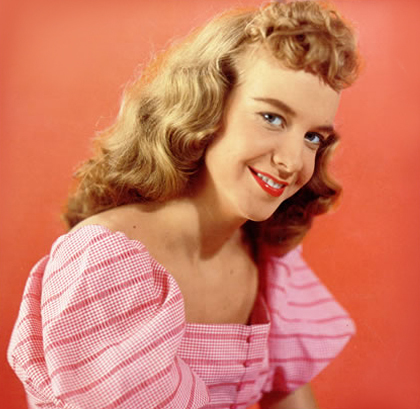 In 1953, the teenager appeared at a Tobacco Festival with Ernest Tubb and Sunshine Sue. As a result of this appearance, Martin was invited to become a regular member of the Old Dominion Barndance in Richmond, Virginia. At that time, that stage show was the third largest in the nation, and included such stars as Jean Shepherd, Hawkshaw Hawkins, Sonny James, Martha Carson, and the renowned Carter Sisters who encouraged Martin to try for the “big time”. With two years of travels with the show, Martin would not only gain valuable show business experience, but also the realization that she now only lived for one thing – entertaining people. Two staff announcers at WRVA (the station that carried the barndance over the CBS network) were successful songwriters and wrote a song called Will You, Willyum (this was just at the birth of the fifties rockabilly music explosion). They asked Janis to sing it on the barndance for audience reaction, and also cut a demo tape of it which they passed on to their publisher in New York. 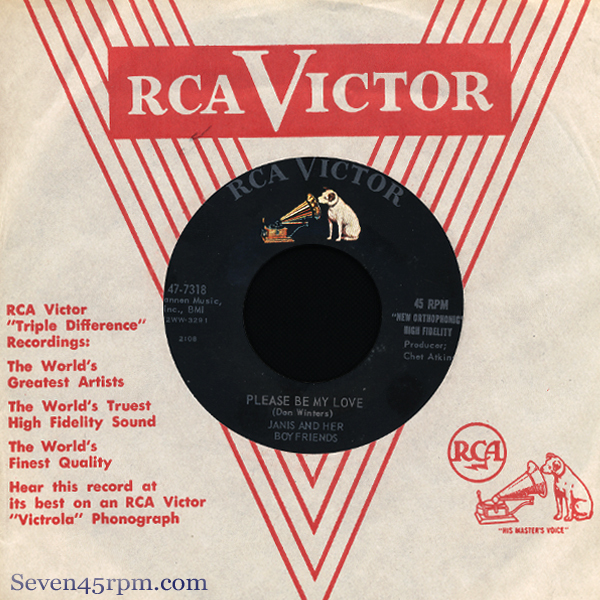 When the demo tape arrived at Tannen Music in New York, the publisher not only accepted the song but rushed over to Steve Sholes of RCA Victor, so he could hear it. Sholes wanted to know who the vocalist was on the tape and called Richmond to find out. Janis was contacted and invited to Nashville to record the song on Victor Records. So, at the age of fifteen, she became a recording artist, and that release would end up being her biggest career hit, selling a massive 750.000 copies! To add to that, on the flip Drugstore Rock And Roll, a song that Janis wrote herself, which you could easily say is her most well known song and is probably the most played in the current scene. Now this was must have been all very exciting for Martin, who although was still relatively very young, had already felt really bored with the slow mainstream country songs she had be singing in the past. She’d already had the spell of R&B over whelm her even as a younger girl, but at that time in the fifties, she would found it difficult to follow that path, being a white girl. In a interview with Bobby Tremble, Martin would remember…”I would go up the road…there was a black church right up above my house…my little cousins wanted to play on Sundays and I would want to go up and lay in the weeds and listen to them sing”. She goes on to say…”It was that soul, it was that rhythm….and when I heard it…I said that is my music”. Martin and accompaniment were determined to find a new sound however, so they combined what you would then call hillbilly music with rhythm and blues…and this was all part of the birth of rockabilly music…which would grow like a beast and change many lives. But Martin recalls just how tough it was for those first ladies, who were breaking out into this new crossover wave, which would include Wanda, Brenda Lee and of course Charline Arthur (who was the first female singer in country music to perform in pants, and she supposedly used the extra freedom to prowl the stage). There was some nasty slander coming from some of the men at the time, accusing Martin of being spawned from the devil, but the barefooted ponytail teen would not let that get in the way! Bu t some of the publicity rebounded for Janis as fans felt she was hooking her style as a means of exploitation. And although they both used the same session musicians and shared the same country-R&B interests, Martin never saw the Memphis Flash perform until he made it to national television. By that time she had independently developed her own amazingly similar performing style which was well established and locked down. Additionally, she only met Elvis twice, both times very briefly, with hardly a word exchanged. The two found themselves converging on a similar point. 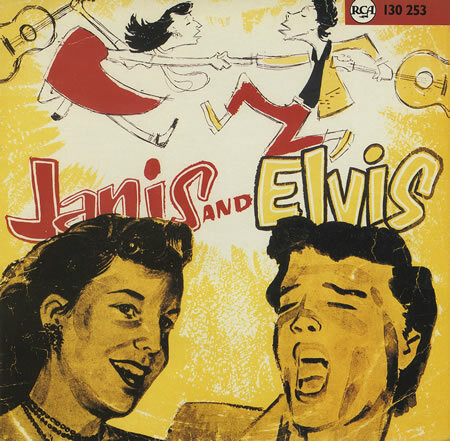 There was a 10″ Ep release titled Janis And Elvis (RCA-T31,077) which included 4 tracks from Martin as well as 4 tracks from the King himself, however it seems it was was pulled only 2 days on the market! And all because Elvis’ manager, Colonel Tom Parker didn’t want Janis’ name printed in front of Elvis’ name! Of course this record is worth a heap! Eventually Martin was not only accepted, but would be in constant demand for TV, radio and stage appearances all over the US, and would appear on the Tonight Show, American Bandstand and Ozark Jubilee. 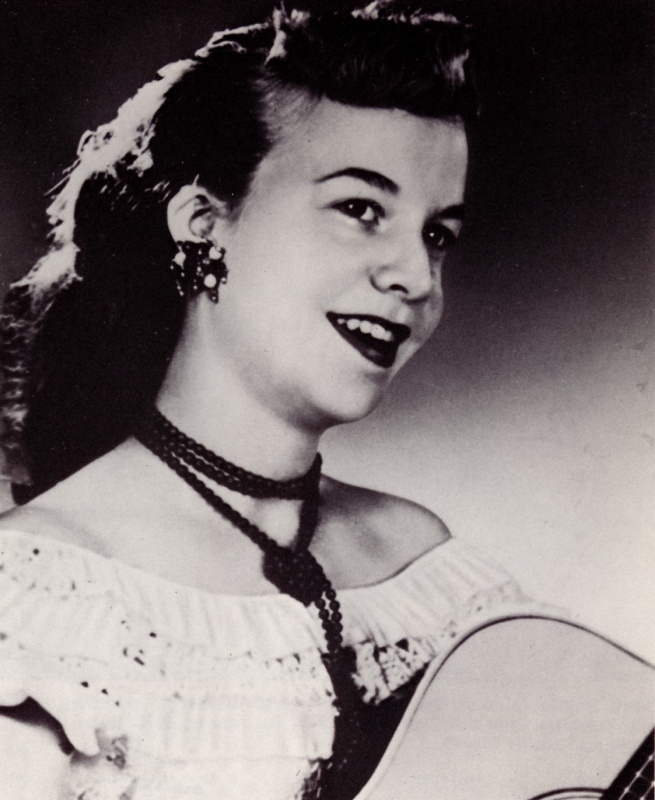 She did her first road tour with Hank Snow and went on other tours with many greats including Johnny Cash and Carl Perkins. 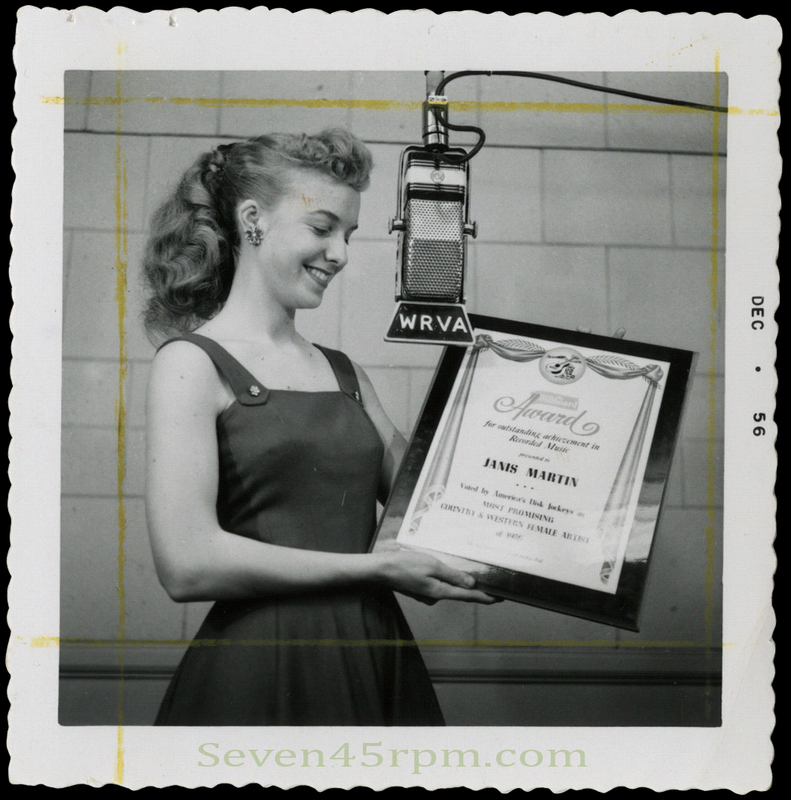 Martin was voted the Most Promising Female Artist of 1956 at the annual disc jockey convention and received the Billboard Magazine award on plaque. With much success behind her, she formed her own band called Janis Martin and the Marteens and began her travels in the U.S. and Canada, playing clubs and fairs. Apparently she also did a screen test for MGM, but not sure that pretty face made it on film…which would be a damn pity! In 1957, she was chosen by RCA to become a regular member of the Jim Reeves show and traveled with him exclusively. The show went overseas to entertain the armed forces in Europe. On returning to the States, Janis appeared on the Today Show with Dave Garroway to tell of their experiences and to sing her latest record, My Boy Elvis. After this show, she was invited to appear at the Grand Old Opry. The next year Janis and Her Boyfriends released this little beauty, Bang Bang. It’s credited to Clavelle Isnard, someone I can’t seem to find out too much about, other than he co wrote some tracks with Jimmy Holland…but never the less…this has to be my Janis Martin pick! Martin also loved this tune, as noted by Stephanie P. Lewin-Lane on her 2012 Sweet Nothings thesis…”I loved it because it moved. 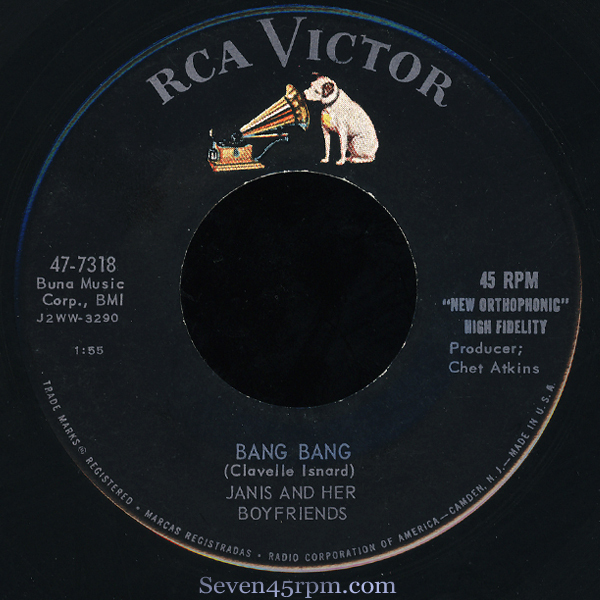 Bang Bang Bangitty Bang Bang…(laughing)…kinda vulgar for the ’50’s, ya know? Hidden messages and all of that, but I mean I liked the song, I didn’t think about the words then, I just liked the tempo, the tune of it, how it moved…” It certainly does move Miss Martin! Everything seemed to be going well for Martin, well until 1958, when it was discovered that the teen had been secretly married to Tommy Cundiff, since 1956. Martin met the singer who was about six years older, when she was only 11 (they both played on the same show on WBTM), and the two started dating when she was 13. He would soon join the paratroopers but before being shipped out to Germany, he wanted to marry Martin and showed her a diamond ring. The two eloped when Martin was only 15…they married on January the 2nd of 1956. Martin actually didn’t record for RCA until March the 8th of 1956, so she didn’t tell the record company, nor did she mention it to her parents until about 3 months later. Tommy was off overseas only 8 days after their marriage and Martin wouldn’t get to see him for another fourteen months or so. Martin was on the USO tour in March/ April of 1957 and meet up with her husband in Frankfurt, who was able to get a 30 day leave so they could spend some time together. As a consequence from their a romantic interlude, Martin fell pregnant. The record executives were furious with Martin when they had finally found out about this, saying she had destroyed the innocent teenage image they worked so hard to sell her on…and was dropped by the label in short order. A pregnant teen they believed, would not be to good for marketing, especially upon learning that this innocent cute girl got hitched at 15. For all of her early success, Martin was never able to sustain a rock & roll career, mostly because of her gender and the changing times. Her stage moves and lusty delivery appeared unseemly (or so people said, especially on the country circuit) in a girl, once the initial furor and enthusiasm for rock & roll quieted down. 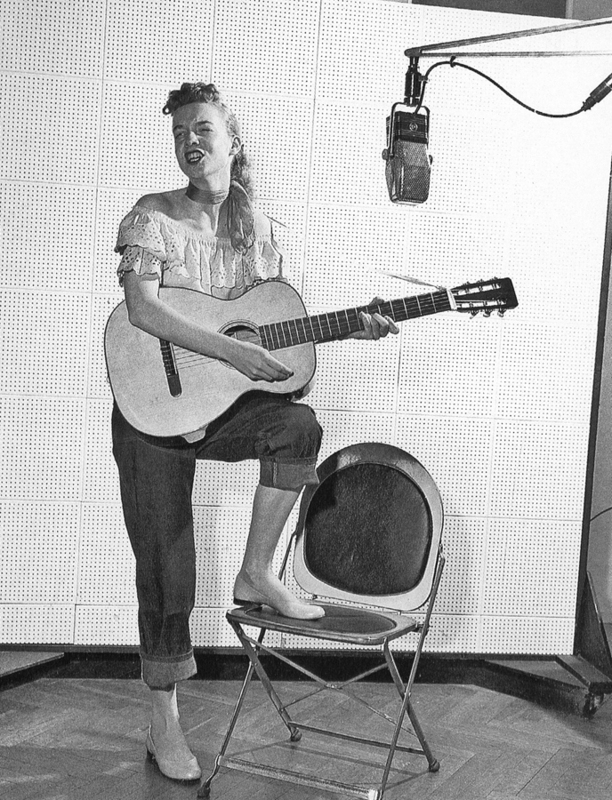 Her record company and management wanted her to keep pushing rockabilly in her stage act, while promoters doing the bookings preferred that she do straight country, and Martin found herself caught between conflicting currents. Martin tried to keep a music career going and was courted by both King Records and Decca Records before signing with a Belgian-owned label called Palette, for which she cut four sides in 1960. She was on her second marriage by then, and husband number two (whom she later divorced) didn’t take well to her popular stage career, and persuaded her to leave show businesses. But by the seventies, Janis had had enough of being the “ordinary” little housewife and cook, and really missed the adoration that she once got from her fans. So she formed a new band…Janis and the Variations, which included her husband on drums. The band did become fairly successful in that they had constant work playing 3 state areas every weekend. However hubby wasn’t liking the journey as much as Martin, claiming it was interfering with their marriage. In 1973, he mistakenly gave her the ultimatum again, their marriage or the band! But this time…about 13 years after that first time he made such a statement, Janis gladly chose her music. Her son, who had been playing drums since the age of 7, gladly took the vacant spot and they would go on to tour Europe, where she encountered strikingly enthusiastic audiences, ready to embrace her as though it were still 1958. The band continued ’til 1982. Martin passed away on September 3, 2007, after being diagnosed with terminal cancer which had spread all over her body. She had been suffering from severe headaches over the past several months so she found it necessary to cancel her recent booking at the Americana Festival in England. The headaches turned out to be stress related from all the grief she had to endure from losing her son Kevin who passed away in January that year. She may have had a short career in recording music, but it was so fantastic, and so very important, as without a doubt she paved the way for future women rock singers!